Kfiriim Highlights – 4th of July and Achla Yom Fun! 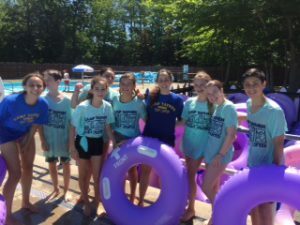 Kfirim has been having so much fun! We watched an exciting movie on Monday night in preparation or the 4th of July. On July 4th, we had a lot of fun participating in a parade with the whole camp – we got to dress up as superheroes! The parade went all around camp and ended in the Beit Am (gym) for patriotic singing and dancing. Everyone was then given a cupcake to celebrate America’s birthday. We had fried chicken for dinner and then had a talent show. 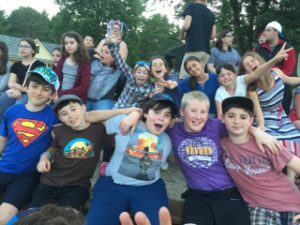 After the talent show there was an amazing fireworks show and the chanichim were excited to have popcorn and soda as a special treat. We woke up yesterday morning and headed to Water Country. 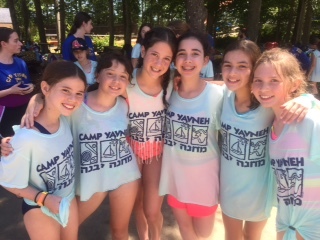 The chanichim really enjoyed the day. They were divided into different groups that were based on the level of intensity of rides that people wanted to go on, so everyone was able to choose their type of rides! There were so many fun rides from Geronimo to the Lazy River and the Wave Pool. Our peulot erev last night was was an army capture the flag game. 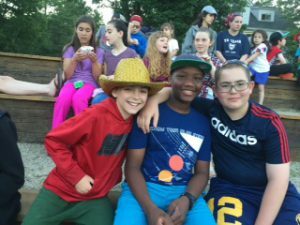 The chanichim had the opportunity to experience an authentic army training followed by a 4-way capture the flag “battle.” The kids really enjoyed running around and had an absolute blast. We are very excited for bunk activities tonight planned by the madrichim (counselors) and our second Shabbat together!